The 1999 East Timorese crisis began with attacks of general violence throughout the country, centered in the capital Dili. The violence erupted after a majority of eligible East Timorese voters chose independence from Indonesia. Some 1,400 civilians are believed to have died. A UN-authorized force (INTERFET) consisting mainly of Australian Defence Force personnel was deployed to East Timor to establish and maintain peace. Indonesian President BJ Habibie takes the presidential oath of office on 21 May 1998. Independence for East Timor, or even limited regional autonomy, was never going to be allowed under Suharto's New Order. Notwithstanding Indonesian public opinion in the 1990s occasionally showing begrudging appreciation of the Timorese position, it was widely feared that an independent East Timor would destabilise Indonesian unity. Renewed United Nations-brokered mediation efforts between Indonesia and Portugal began in early 1997. The 1997 Asian Financial Crisis, however, caused tremendous upheaval in Indonesia and led to Suharto's resignation in May 1998, ending his thirty-year presidency. Prabowo, by then in command of the powerful Indonesian Strategic Reserve, went into exile in Jordan and military operations in East Timor were costing the bankrupt Indonesian government a million dollars a day. The subsequent "reformasi" period of relative political openness and transition, included unprecedented debate about Indonesia's relationship with East Timor. For the remainder of 1998, discussion forums took place throughout Dili working towards a referendum. Indonesian Foreign Minister Alatas described plans for phased autonomy leading to possible independence as "all pain, no gain" for Indonesia. On 8 June 1998, three weeks after taking office, Suharto's successor B. J. Habibie announced that Indonesia would soon offer East Timor a special plan for autonomy. In late 1998, the Australian Government of John Howard drafted a letter to Indonesia advising of a change in Australian policy, and advocating a referendum on independence within a decade. President Habibie saw such an arrangement as implying "colonial rule" by Indonesia and he decided to call a snap referendum on the issue. 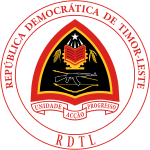 Indonesia and Portugal announced on 5 May 1999 that a vote would be held allowing the people of East Timor to choose between the autonomy plan or independence. The vote, to be administered by the United Nations Mission in East Timor (UNAMET), was originally scheduled for 8 August but later postponed until 30 August. Indonesia also took responsibility for security; this arrangement caused worry in East Timor, but many observers believe that Indonesia would have refused to allow foreign peacekeepers during the vote. As groups supporting autonomy and independence began campaigning, a series of pro-integration paramilitary groups of East Timorese began threatening violence—and indeed committing violence—around the country. Alleging pro-independence bias on the part of UNAMET, the groups were seen working with and receiving training from Indonesian soldiers. Before the May agreement was announced, an April paramilitary attack in Liquiça left dozens of East Timorese dead. On 16 May 1999, a gang accompanied by Indonesian troops attacked suspected independence activists in the village of Atara; in June another group attacked a UNAMET office in Maliana. Indonesian authorities claimed to be helpless to stop what it claimed was violence between rival East Timorese factions, but Ramos-Horta joined many others in scoffing at such notions. In February 1999 he said: "Before [Indonesia] withdraws it wants to wreak major havoc and destabilization, as it has always promised. We have consistently heard that over the years from the Indonesian military in Timor." As militia leaders warned of a "bloodbath", Indonesian "roving ambassador" Francisco Lopes da Cruz declared: "If people reject autonomy there is the possibility blood will flow in East Timor." One paramilitary leader announced that a "sea of fire" would result in the event of a vote for independence. As the date of the vote drew near, reports of anti-independence violence continued to accumulate. The day of the vote, 30 August 1999, was generally calm and orderly. 98.6 percent of registered voters cast ballots, and on 4 September UN Secretary-General Kofi Annan announced that 78.5 percent of the votes had been cast for independence. Brought up on the "New Order"'s insistence that the East Timorese supported integration, Indonesians were either shocked or incredulous that the East Timorese had voted against being part of Indonesia. Many accepted media stories blaming the supervising United Nations and Australia who had pressured Habibie for a resolution. 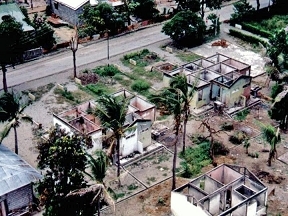 As UNAMET staff returned to Dili following the ballot, towns began to be systematically razed. Within hours of the results, paramilitary groups had begun attacking people and setting fires around the capital Dili. Foreign journalists and election observers fled, and tens of thousands of East Timorese took to the mountains. Indonesian Muslim gangs attacked Dili's Catholic Diocese building, killing two dozen people; the next day, the headquarters of the ICRC was attacked and burned to the ground. Almost one hundred people were killed later in Suai, and reports of similar massacres poured in from around East Timor. The vast majority of the UN staff locked down in their Dili compound, which had been flooded with refugees, refused to evacuate unless the refugees were withdrawn as well, insisting they would rather die at the hands of the paramilitary groups. At the same time, Indonesian troops and paramilitary gangs forced over 200,000 people into West Timor, into camps described by Human Rights Watch as "deplorable conditions". After several weeks the Australian Government offered to allow the refugees in the UN compound along with the UN staff to be evacuated to Darwin, and all the refugees and all except four UN staff were evacuated. When a UN delegation arrived in Jakarta on 8 September, they were told by Indonesian President Habibie that reports of bloodshed in East Timor were "fantasies" and "lies". General Wiranto of the Indonesian military insisted that his soldiers had the situation under control, and later expressed his emotion for East Timor by singing the 1975 hit song "Feelings" at an event for military wives. Indonesia, in dire economic straits, relented. President BJ Habibie announced on 12 September that Indonesia would withdraw its soldiers and allow an Australian-led international peacekeeping force to enter East Timor. The Indonesian garrison in the east of the island was Battalion 745, the bulk of which was withdrawn by sea, but one company, taking the battalion's vehicles and heavy equipment, withdrew westwards along the northern coastal road, towards Dili and the Indonesian border, leaving death and destruction as they went. They murdered dozens of innocent and unarmed villagers along the way and, near Dili, killed one journalist and attempted to kill two more. On 15 September 1999, the United Nations Security Council expressed concern at the deteriorating situation in East Timor, and issued UNSC Resolution 1264[permanent dead link] calling for a multinational force to restore peace and security to East Timor, to protect and support the United Nations mission there, and to facilitate humanitarian assistance operations until such time as a United Nations peacekeeping force could be approved and deployed in the area. HMAS Jervis Bay in Dili in October 1999. The International Force for East Timor, or INTERFET, under the command of Australian Major General Peter Cosgrove, entered Dili on 20 September and by 31 October the last Indonesian troops had left East Timor. The arrival of thousands of international troops in East Timor caused the militia to flee across the border into Indonesia, from whence sporadic cross-border raids by the militia against INTERFET forces were conducted. The United Nations Transitional Administration in East Timor (UNTAET) was established at the end of October and administered the region for two years. Control of the nation was turned over to the Government of East Timor and independence was declared on 20 May 2002. On 27 September of the same year, East Timor joined the United Nations as its 191st member state. The bulk of the military forces of INTERFET were Australian—more than 5,500 troops at its peak, including an infantry brigade, with armoured and aviation support—while eventually 22 nations contributed to the force which at its height numbered over 11,000 troops. The United States provided crucial logistic and diplomatic support throughout the crisis, while the cruiser USS Mobile Bay operated in open ocean at arms length, whilst Australian, Canadian and British ships entered Dili. A US Marine infantry battalion of 1,000 men—plus organic armour and artillery—was also stationed off the coast aboard the USS Belleau Wood to provide a strategic reserve in the event of significant armed opposition. ^ a b "The US imposed military sanctions (arms embargo and suspension of military assistance) against the Indonesian government on September 9, 1999 (the US government lifted military sanctions against the government on November 22, 2005); from google (us embargo indonesia east timor 1999) result 7". ^ "The United States has suspended military ties between its own armed forces and the Indonesian military in the wake of the chaos in East Timor; from google (us embargo indonesia east timor 1999) result 5". ^ "U.S. Removes Six-Year Embargo Against Indonesia; from google (bush embargo indoesia) result 5". ^ "British arms companies are to begin selling weapons and defence systems to Indonesia for the first time in 13 years, under plans to be discussed by David Cameron today; from google (bush embargo indoesia) result 5". ^ "Sales have been resumed since January 17th 2000; from google ( european union embargo indonesia ) result 3". ^ "17 January, 2000; from google ( european union embargo indonesia ) result 4". ^ Schwarz (1994), p. 228. ^ Marker (2003), p. 7. ^ a b Nevins, p. 82. ^ "Howard pushed me on E Timor referendum: Habibie". ABC News. Retrieved 16 October 2014. ^ Quoted in Nevins, p. 84. ^ Both quoted in Nevins, p. 91. ^ Quoted in Nevins, p. 92. ^ International Federation for East Timor Observer Project. "IFET-OP Report #7: Campaign Period Ends in Wave of Pro-Integration Terror". 28 August 1999. Retrieved on 17 February 2008. ^ a b Shah, Angilee. "Records of East Timor: 1999" Archived 2 January 2008 at the Wayback Machine. 21 September 2006. Online at the UCLA International Institute. Retrieved on 17 February 2008. ^ "Indonesia/East Timor: Forced Expulsions to West Timor and the Refugee Crisis". Human Rights Watch. December 1999. Retrieved on 17 February 2008. ^ Quoted in Nevins, p. 104. ^ "Wiranto – survivor with iron will". BBC News. 13 February 2000. Online at bbc.co.uk. Retrieved on 17 February 2008. ^ "The Howard Years: Episode 2: "Whatever It Takes"". Program Transcript. Australian Broadcasting Commission. 24 November 2008. Archived from the original on 23 September 2010. Retrieved 19 October 2014. ^ "New country, East Timor, is born; UN, which aided transition, vows continued help" Archived 10 July 2011 at the Wayback Machine. UN News Centre. 19 May 2002. Retrieved on 17 February 2008. ^ "UN General Assembly admits Timor-Leste as 191st member" Archived 18 December 2007 at the Wayback Machine. UN News Centre. 27 September 2002. Retrieved on 17 February 2008. ^ Horner 2001, p. 9. ^ See Smith 2003, p. 47 and 56 and Martin 2002, p. 113. Robinson, Geoffrey (2011). "If You Leave Us Here, We Will Die": How Genocide Was Stopped in East Timor. Human Rights and Crimes Against Humanity series. Princeton, NJ: Princeton University Press. ISBN 9780691150178.